Itâ€™s only mid-April, but at 90 degrees, summer has arrived in Florida. Summer, that season that drains my body of energy and leaves me to wilt in the heat or sends me rushing to hide in the cool of the climate controlled indoors. Parched. Thatâ€™s a word I think of when I think of summer. Parched gardens longing for moisture. Parched throats longing for a cool drink of water. Have you ever been parched, shriveled dry and desperately thirsty? Imagine that feeling of longing, that deep need to be restored. Then imagine someone brings you a glass of water, clinking with ice, shrouded with drops of condensation. And for a moment all you can do is stare at the glass, memorizing the look of it. Longing for relief you reach forward and run a finger down the side of the glass through the condensation. You press the finger to your lips and the dampness brings a momentary relief to your lips even while it stirs your thirst. You reach down and with both hands encircling the glass and you hold it. The cold seeps into your skin and the ice clinks in the glass. You raise the glass and you press it to the side of your face and then roll it slowly across your forehead savoring its cool touch against your hot and dehydrated skin. Then you set the glass down in front of you and with a sigh you arise and return to your work. But you are still parched. The dampness on your lips and the coolness on your head will do nothing to sustain you. You must actually drink the water! It may be a silly illustration, but I think that it describes how I sometimes seek to sustain myself. In fact, Iâ€™d put money on the fact that itâ€™s not just a problem for me, but that many, many believers find themselves going through these very same motions in their spiritual life. We do everything but actually drink of the living water. Jesus comes to us with an invitation. He does not speak idle words, nor are they a one-time offer. â€œCome to me, all you who are weary and burdened, and I will give you rest. â€œRemain in me, as I also remain in you. We have an invitation to come to the source of Living Water. Jesus offers us rest and refreshment if we will abide in Him. But how often do we move toward Him and yet neglect to actually drink? We come to Him, but we neglect to learn from Him, to abide in Him. I think it happens more often than we care to admit, especially for those who are serving in ministry. The Words of Life are our livelihood. The Scripture is not just for our personal edification and growth, it is our message and its truth is the foundation of all our work. We hear the Words day in and day out. But how often do we accept the invitation to drink? How often do I let the familiar words penetrate between flesh and marrow and how often do I simply observe them, like condensation running down the side of a glass, but fail to drink in that which my soul needs? Sometimes I bring that beautiful glass of water up to my face and cool myself with its moisture. I rest against it and expect that external contact to sustain me. This is a picture of my life when I neglect solitude and silence with God. I know beyond a shadow of a doubt that this discipline is essential to the state of my spiritual life. If I neglect solitude and silence my mind is filled with a sense of busyness that crowds out my ability to listen well to the Spirit. Without solitude and silence I cannot abide. I know this. And yet it is so easy to allow this time consuming discipline to slip away in light of lifeâ€™s day to day demands and the needs that are all around me. Then, when I find my way back into the stillness of time set apart with the Lord it can be akin to drinking the glass down in one long draught and I wonder why I let myself get so parched with thirst. But sometimes itâ€™s a slow reversal, like finishing a long marathon and discovering you are completely dehydrated and overcome with muscle cramps.Â You rehydrate your body through the pain.Â Sometimes I find that coming awake to God is like this. There is a painful process of toxins being removed and hydration being restored. Still, whether the process is painful or whether it brings instant joy, I canâ€™t deny that my deepest desire is to be refreshed, restored, renewed. I want to rest and I want to abide. The question is not should I drink. I know that I should. The question is will I drink? Will I daily arrange my life in such a way that I am not just gazing on or handling the living water, but so that I am actually drinking, coming, abiding in its life. That begs the questions of how do you do it? How do you arrange your life to meet this deep desire? 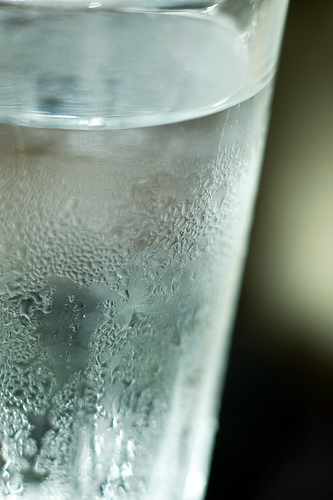 What would it look like to move toward daily drinking the living water? Everyone is unique and the mix of spiritual practices that help me abide well in Christ are not necessarily the same practices that will be most effective for you. There are, however, some basic disciplines that every believer can draw from to open their life to a deeper practice of abiding in Christ. Solitude: Being alone with God. Silence: Being still and silent in a posture of listening before God.Â Giving Him your whole attention to be better able to hear His voice. Being silent before others to better listen to them and engage them at a soul level. Prayer: Conversation with God. Listening and responding; thanking and petitioning. Fasting: Going without food (or something else) in order to devote yourself to prayer.Â Entering deeper into the heart of God, aligning yourself with His desires above your own. Honoring Your Body: Paying attention to habits of eating, exercise and sleep, as it is through our bodies that we participate in Godâ€™s activity in the world. Sabbath: Honoring Godâ€™s provision and denying your own need for control by setting aside a day in which to rest from all that is necessary and engage in only those things that bring life to your soul. Engaging the Word: Opening your heart to the life changing power of the Scriptures through reading, reflection and meditation on the Word. Allowing Godâ€™s Word to be profitable in your life. Worship: Worship is our continual sacrifice of praise to God and can be expressed in a thousand forms.Â My personal favorites are worship in music, nature, creating and keeping a gratitude journal. Sacred Companionship and Community: Engaging other believers in prayerful conversation, listening to others in the Spirit and sharing our own lives without self-protection. Personal Reflection: Taking time to notice your own life so that you are aware of your circumstances, your suppositions, your sin and your holy desires in order to be able to move into a deeper freedom in Jesus Christ and to live with a fuller representation of His love. Service: Allowing your life in Christ and your love of God to overflow to others as you actively participate in being the hands and feet of Jesus to a world in need. Sacrifice: Being financially generous as an act of worship and trust in God’s provision. Submission and Humility: Practicing submission to God and others by refusing to assert our own cause or our perceived rights, but instead taking on the nature of a servant and living for the honor and glory of God alone. Humbling ourselves in imitation of Christ and living without boasting or seeking the acclaim of men for our good deeds. If you are looking for a good, easy to follow resource to help you explore and discern what practices may lead you to a deeper place of abiding in Christ then Iâ€™d highly recommend Ruth Haley Bartonâ€™s Sacred Rhythms DVD and Study Guide. While I personally recommend the visual imagery presented in the DVD, you can also read the same content in her book, Sacred Rhythms.